Hope everyone had a good weekend! We had a very relaxing weekend at home. Hubby's dental surgery went well on Friday morning and now is recovering very well. I'm back to 100% me and Big A who had cough on Friday is getting better after taking a lot of rest on the weekend. So everyone seems to be back in a good shape. Monday bento is panda bento. I tried to use nori for the ears and eyes but my nori started to shrink quickly that I had to replace them with brown egg sheet (mixed dark soy sauce with egg). Little A originally asked for Pokemon bento but I told him that he could have it this week but not on Monday. I will need to look at their Pokemon books to find some inspirations for the Pokemon bento. Inside the box : braised five-spice chicken and potato, sauteed tofu and egg, rice. Fruits in separate box (not featured in this picture). @Dino : Thanks a lot for your kind comment! Hi Lia, beautiful and cute bento as usual...:)!! Sorry for not commenting for some time, as you know I have been away from the virtual world due too much good foods in Jakarta ;). So happy that I could meet you in person, hopefully I didn't bore you to death in Sushi Tei, haha;). I should thank my mum for making it livelier ;). I will still be away from the blogsphere for some time due to my driving course, I think I told you about it. So my days are now filled with filling out horrendous car-related questionnaires. I'll have the theory test next week and I am nervous like hell...!! Well, wish me luck and I hope we can meet again next time I am in Indo :D)! Great to hear that hubs surgery went well! N I like the reddy nose! @Xelia : Thanks a lot Xelia! Hi Lia, glad to hear that everyone is in good shape. The panda is so lovely & braised five-spice chicken & potato looks yummy too. Good to hear you are all feeling well and your husband surgery went well. I was wondering how you got the brown around the panda's eyes! It looks tasty too. 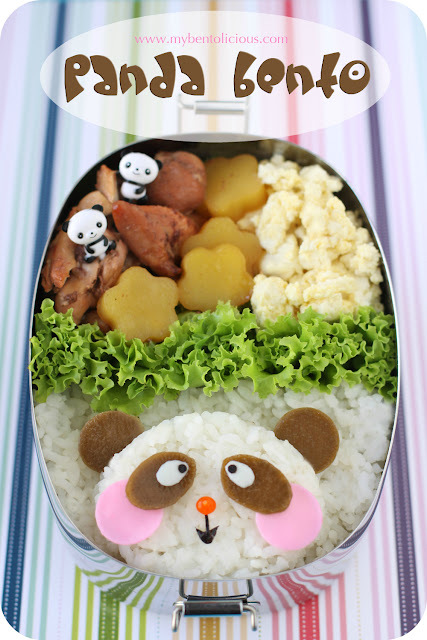 Love your cute little panda bento! Glad to hear everyone is back to health. Hope you had a relaxing weekend and ready to start the next week with lots of energy! @Fang Fang : Thanks a lot Fang! @Felicia Dita Antefa : Thanks a lot Felicia! Love the panda eyes :) Thank you for submiting to the Wholesome Lunchbox. @Yoan : We are going to watch Kungfu Panda 2 today. Hope I can get some inspiration from it :) Thanks Yoan! How's the movie? Super funny i bet. I'm thinking of baby po inside the radish box. It'll be cute! !